The lightly grilled beef sirloin with béarnaise mayo’ and pan-fried tomatoes is pure comfort food, and our regulars love it. Our Head Chef, Jimmi Bengtsson, found inspiration in the eternal favourite, beef béarnaise, for this popular “smørrebrød” dish. Season the steaks with salt and pepper, and pan-fry them one to two minutes on each side at medium heat. Leave the steaks to rest for as long as they have been on the pan, and slice them thinly lengthwise. Stir the Dijon mustard and the pickled tarragon in the mayonnaise and add salt and pepper to taste. Melt the butter on a hot pan and fry the tomatoes for two to three minutes till they colour. Add salt and pepper to taste. Arrange the sliced sirloin on the buttered rye bread. 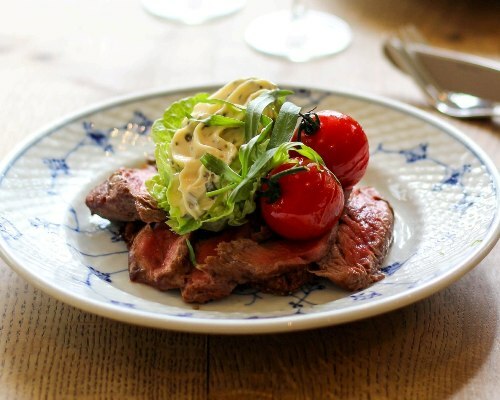 Place the lettue leaves on top of the sirloin and top with two to three tablespoonfuls of béarnaise mayo’, two cherry tomatoes and the fresh herbs. If you want your “smørrebrød” to pack more of a punch, grate some fresh horseradish on top of the béarnaise mayo’. We recommend a crisp Bombay Pale Ale from Nørrebro Bryghus and a classic Kronborg Akvavit with the the lightly grilled beef sirloin.